In the interval between wakefulness and sleep, the lavishly embellished animals of my youth go round and round. They are proud and perfect and pristine, treasured for their inspired detail and spirit. There are real animals in my life, but it is the intricate counterfeits that animate my dreams. The ghosts of these charlatans leap and bow before me, begging me to set them free. The carousel animals haunt me because I know them. When they began their procession through my childhood home, I had known no other animals. My father, intolerant to the messes that came with typical household pets, had declared a moratorium on all things beast before I’d even existed. That is, until he discovered the carousel horse. As the story goes, he was driving home from work one rainy evening when he stopped to offer assistance to a broken-down tractor-trailer. Tucked beneath a blanket of blue tarps, he saw a tangle of knobby limbs, thick necks, and flowing manes. And thus, the parade began—my father the grand marshal, and the truck driver, a staggeringly talented carver named Daniel, bringing up the rear. Overnight, our formerly furless home became a menagerie. Elaborately ornamented horses, camels, pigs, giraffes, and even an ostrich or two gilded every room. There was a fierce beauty and a quiet dignity to the creatures; their enviable qualities enchanted the hordes of guests who came to see, and often to buy. With the exception of a few special pieces, the carousel figures came and went. The house evolved. What had once been a simple roof overhead was now a cross between a ghoulish zoo and a museum. Glassy, unseeing eyes. Legs bent in motion, carrying lean bodies to nowhere. Gaping mouths, gasping for breaths that never came. They were everything my father wanted out of his animals—beauty and perfection and rigid obedience. They could be repositioned. Admired. Proudly purchased. Easily sold. And as they took up residence in every room in our home, so, too, did my dad’s expectations. 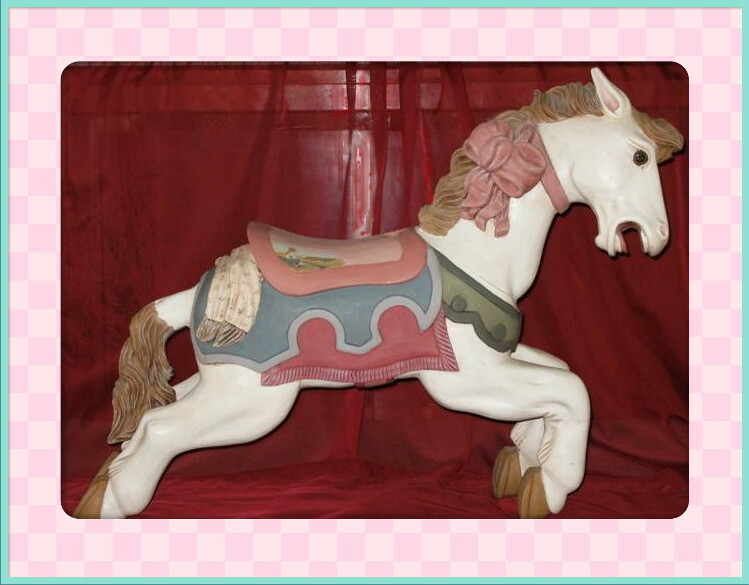 When I turned five, the loft was converted into my very own room, the decorative scheme inspired by a white horse with a deep pink ribbon flowing from its sinewy neck. No one seemed to notice how that pink ribbon angrily clashed with the blood-red shag carpeting. Every night, my father would slowly climb the stairs to my loft. As horse with the pink ribbons looked on with unseeing eyes, my father would scrutinize the sanguine floors and the furniture and the closets for anything out of place. No matter how hard I would try, I was never quite as immaculate, as utopian, as that horse. And there, throughout my childhood, she stood. The sterile sentinel. So many years from horses and blood beneath my feet and daddy’s expectations, I am just a dream away from a time when I wished so desperately to be another carousel in his collection. I think, in truth, he wished it too. Some nights, I allow myself to look closely at those carefully crafted forgeries, and I see my own wild desperation mirrored in their icy eyes. They long to break free of the fetters of familial expectations, and I long to help them. But who am I to lead this parade of wooden souls, I wonder, as I neatly fold my clothes into the drawer and check to see, before I close my eyes, that everything is in its place. Kimberly Hamilton lives in the beautiful Gunnison Valley of Colorado. When her dogs and husband aren’t vying for her attention (food), she does laundry. And writes, from time to time. She is a student in the mainstream and genre fiction graduate program at Western State College.